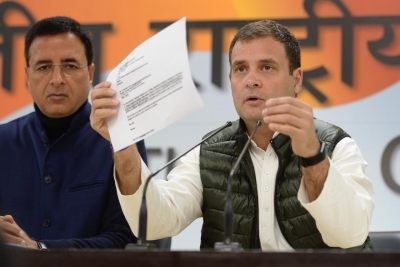 New Delhi, Feb 12 (IANS) Reliance Defence said the "proposed MoU" cited by Congress President Rahul Gandhi on the Rafale deal on Tuesday was a reference to its cooperation with Airbus Helicopter and had "no connection" with the Rafale deal. At a press conference, Gandhi accused Prime Minister Narendra Modi of "treason" and violating the Official Secrets Act by leaking information on the Rafale jet contract, citing an email to claim a private business entity was aware of the deal days before India and France signed it. "Purported email being referred by the Congress Party is regarding the discussion between Airbus and Reliance Defence regarding Civil & Defence Helicopter Programmes under 'Make in India'," a Reliance Defence statement said. "The discussion on proposed MoU was clearly with reference to cooperation between Airbus Helicopter and Reliance. It had no connection whatsoever with Government to Government Agreement between France and India for 36 Rafale aircraft," the statement said. Referring to the fact that the MoU for Rafale aircraft was signed between France and India on January 25, 2016 and not in April 2015, the company said: "From the above, it is evident that the facts are being deliberately twisted and reality being ignored."